The design of the coin features the coat of arms of the Government of Gibraltar which combines that of Her Majesty’s Government and Gibraltar’s own coat of arms. HM Government of Gibraltar coat of arms consists of a quartered shield of which the first and fourth quarters show the passant guardian lions of England. The second quarter features the rampant lion and double treasure Flory counterflory of Scotland and in the third a harp for Ireland. The crest is a guardian lion wearing the St Edward’s Crown and the dexter supporter is a likewise crowned English lion. The sinister is a Scottish unicorn which, according to legend, is a very dangerous beast therefore the heraldic unicorn is chained. Gibraltar coat of arms consists of an escutcheon and a three-towered castle under which hangs a golden key. The significance of the keys is that they have come to symbolise the possession of the Fortress by Great Britain since the capture of The Rock in 1704. 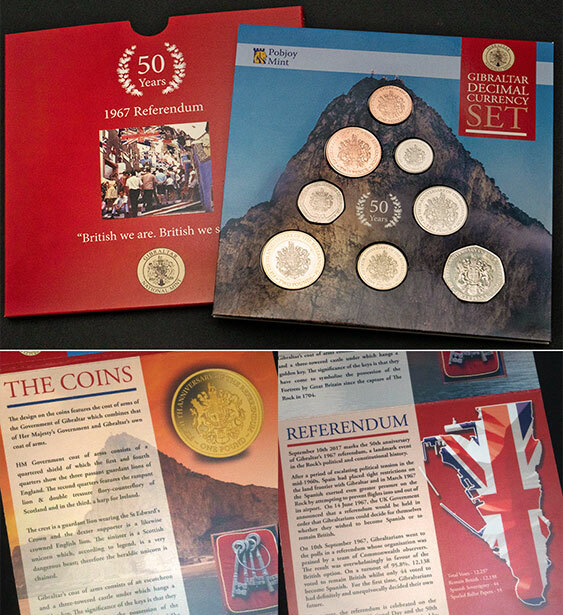 The coin collection marks 50 Years of Gibraltar’s referendum which was held on the 10th September 1967. The result of the Gibraltar referendum was an overwhelming vote by its inhabitants to retain their links with Britain. Of the 12,762 Gibraltarians qualified to vote, no fewer than 12,138 voted to remain with Britain. Only 44 opted for the transfer of the Rock to Spanish sovereignty.